Synthetic peptide (the amino acid sequence is considered to be commercially sensitive) aa 150 to the C-terminus. The exact sequence is proprietary. Our Abpromise guarantee covers the use of ab171951 in the following tested applications. Binds to the mitochondrial light strand promoter and functions in mitochondrial transcription regulation. Required for accurate and efficient promoter recognition by the mitochondrial RNA polymerase. Promotes transcription initiation from the HSP1 and the light strand promoter by binding immediately upstream of transcriptional start sites. Is able to unwind and bend DNA. Required for maintenance of normal levels of mitochondrial DNA. May play a role in organizing and compacting mitochondrial DNA. target DNA. Interacts with TFB1M and TFB2M. Contains 2 HMG box DNA-binding domains. ab171951 staining mtTFA in human kidney tissue sections by Immunohistochemistry (IHC-P - paraformaldehyde-fixed, paraffin-embedded sections). Tissue was fixed with formaldehyde and blocked with 2% BSA for 10 minutes at 21°C; antigen retrieval was by heat mediation in a citric acid. Samples were incubated with primary antibody (1/200 in TBS/BSA/azide) for 16 hours at 21°C. A Biotin-conjugated goat anti-rabbit IgG polyclonal (1/300) was used as the secondary antibody. 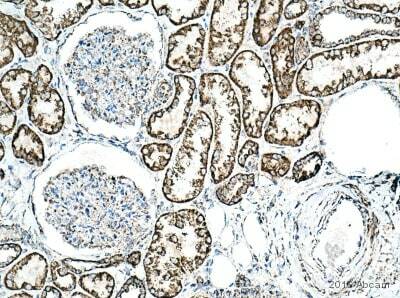 Immunohistochemical analysis of paraffin-embedded Human testis tissue labeling mtTFA with ab171951 at 1/100 dilution. Immunohistochemical analysis of paraffin-embedded Human ovarian carcinoma tissue labeling mtTFA with ab171951 at 1/100 dilution. ab171951 has not yet been referenced specifically in any publications. Publishing research using ab171951? Please let us know so that we can cite the reference in this datasheet.